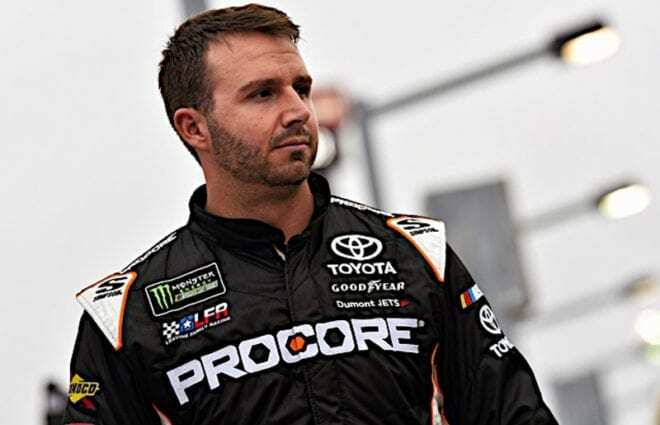 Matt DiBenedetto could have a breakout year in 2019. 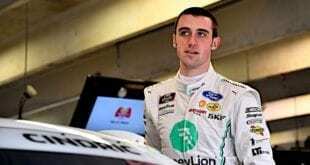 The fifth-year driver joins Leavine Family Racing after doing a lot with a little at Go Fas Racing. LFR switched to Toyota over the off-season and formed an alliance with Joe Gibbs Racing. DiBenedetto’s crew chief this season was Denny Hamlin‘s former crew chief Mike “Wheels” Wheeler. The pairing started out with a bang — DiBenedetto led the most laps (49) in the Daytona 500 before getting spun out by Paul Menard. Frontstretch Editor Michael Massie caught up with DiBenedetto prior to his 26th-place finish at Atlanta Motor Speedway this past weekend. 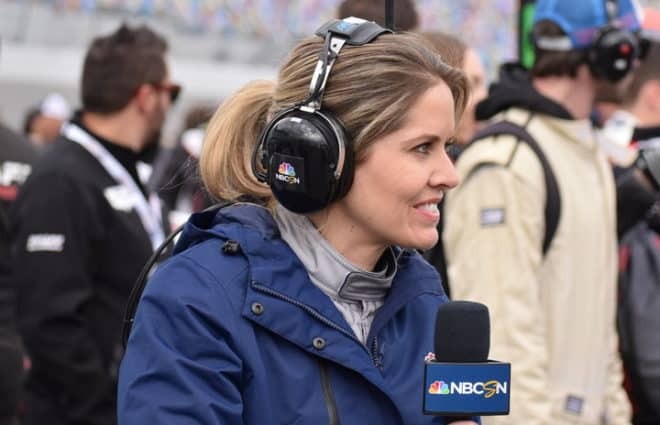 Michael Massie, Frontstretch: You were the feel-good story of the Daytona 500. Unfortunately, it didn’t end so well. But what was it like just to be up there leading laps in the Great American Race? Matt DiBenedetto: It was amazing for not only me, but for our team because they worked so hard. A lot of people knew, we didn’t have a race car. 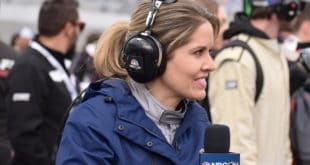 [It was] on the floor like a month or so leading up to the race just because there was so much change and a lot of dedication and investment into making the team better. A lot of work to do in a short time, and that was encouraging for everybody. Massie: Do you expect this team to have more runs like that? Or was it because of the restrictor plate equalizing everything? DiBenedetto: Well, I mean that was obviously setting the bar really high. But no, it did show we’re going to make the most of our equipment this year, no matter where that may fall. I think we’re going to have a lot of runs — I don’t know where to put a number on it — that’ll turn people’s heads. Massie: How does it feel to know tons of people were rooting for you as the underdog? DiBenedetto: That was cool. That always blows me away how much people kind of embrace my story and our story here. I just feel like I just be myself, regular old me. But it always blows me away that people gravitate to our story. I think it’s so cool how many fans we continue to gain, and especially this year. That one race [the Daytona 500] gave us a ton of fans, which is pretty incredible. I think people can just tell how passionate we are. Massie: What’s the attitude at LFR? Are you guys going into the season thinking you’re going to compete for some wins? Or are you trying to step it up to like 15th place every week? DiBenedetto: Yeah, me and Wheels [Mike Wheeler], my crew chief, were talking about that last night. We laughed because we don’t really know how to put a number on it, like we don’t even know where we expect to be. We don’t know, because it’s like I keep saying, there’s a lot of growing and building that we’re doing here at this team, and he’s been a huge part of it. But who knows? We could sneak off a win. We had a shot our first race of the season, and it wasn’t a fluke. They built me a fast race car, so it was all due to their hard work. But yeah, I’d love to have a shot at sneaking a win off. It can happen for sure. But the expectations, I’d like to be, I don’t know, running top 15 pretty consistently. Massie: How does the atmosphere of this team compare to Go Fas Racing? DiBenedetto: It’s a bigger team, more funding and a very passionate group of racers here, which is neat. 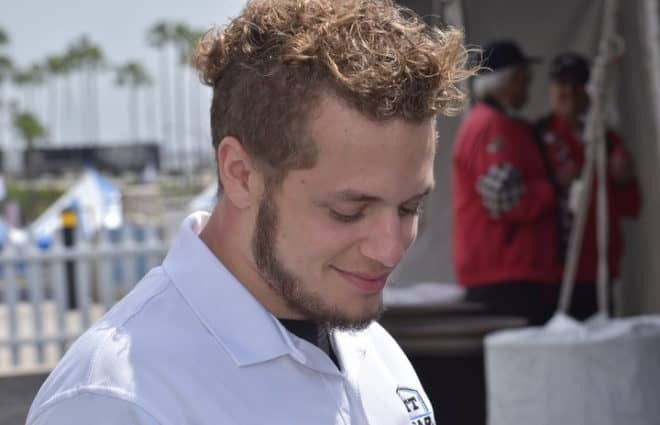 Go Fas was a really great opportunity for me, and I wouldn’t be here without that deal. They were a great group, great family, and I’m still friends with all those guys, Archie and Mason [St. Hilaire]. Mason’s one of my best friends. The atmosphere there was a little different. We were just trying to be smart, take care of the equipment because we couldn’t afford to tear up race cars. Nobody wants to. And make the most of our days and take advantage of other people’s mistakes. Where [at LFR], we’re definitely competing at a different level and have different goals to be a little more aggressive. 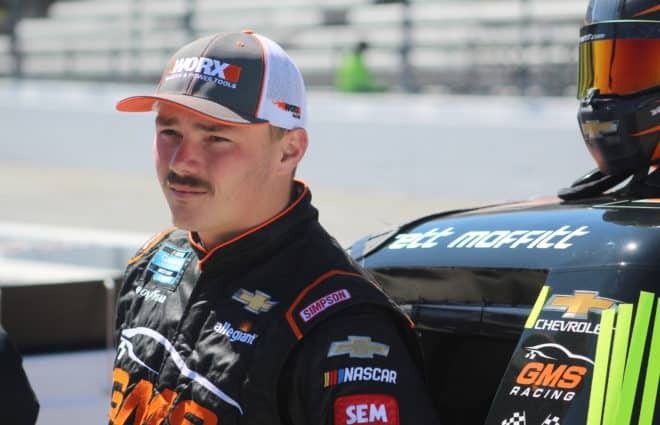 Massie: Speaking of Go Fas, I know you said you wouldn’t want your face on a race car the way that Corey Lajoie had it. But is there any way you guys can one up that great marketing stunt Go Fas pulled off? DiBenedetto: I don’t know. I do anything that sponsors ask, so whatever they want I do. It’s cool, but as far as what we do and I do, I just try to be myself, be genuine, have fun and engage with fans. I think that attracts a lot of people. I don’t try to do anything crazy. Massie: What was it like being in that 18-car pileup? Obviously, it wasn’t fun. But I know once you can’t save it, you take your hands off the wheel. But do you close your eyes? Do you watch it all unfold? What’s that feeling like? DiBenedetto: Both. I felt like I was being bounced around like a pinball. It was less than fun. I got clobbered pretty good by [Martin] Truex [Jr.]. I was actually just disappointed while it was all happening, even though you’re crashing and all that, I was already upset before the crash was even over. Massie: How much does it set a team like this back when you lose a car in a wreck like that? DiBenedetto: Nothing too crazy. I think everyone goes into Daytona with the expectation, knowing there’s a pretty good chance this car’s not going to come back properly. You kind of go into it with that mentality. Hopefully, we survive. Hopefully, we win, but probably won’t. Massie: How closely have you guys worked with Joe Gibbs Racing so far? DiBenedetto: We have a good relationship with them. Obviously, my crew chief Wheels is very experienced with that group. He has great communication with them. We’re not the same as Furniture Row [Racing] yet where we could definitely pull a deal like they did. We’re still in the growing stages, but we’re hoping to get there. But as far as communication, the help that I get from my teammates, Kyle [Busch], Martin [Truex Jr.] and all those guys, that couldn’t be any better, and everyone saw how well they worked with us [in the Daytona 500]. Massie: Are there any tracks you’re looking forward to going to more than others now that you’re with this team? DiBenedetto: Bristol [Motor Speedway], Martinsville [Speedway], road courses. And really, Richmond [Raceway] too. Short tracks and road courses, those are the ones I mark off. Those are just my favorites as far as my driving style and where you can really shine if you do everything right. Massie: With the huge crop of talent that Toyota has in the development series, is there extra pressure to perform immediately? DiBenedetto: My life has been pressure to perform immediately. I’ve always been under the microscope. I’ve always been in positions where make or break. My whole life’s been that way, and I’ve made it this far based on performing under pressure, so I always do it, have no doubt. And I’m surrounded by really good people, so we’re all going to perform together. And I’m not going anywhere, and I have a great relationship with this team already. Toyota has been way beyond amazing to me, and they treat me like family. And the same with Gibbs. So I’m not going anywhere. We’re just going to continue to build together in this deal. Massie: How does it feel to have an old school ride where you’re not the one bringing tons of money to the table and the team kind of has the sponsorship set up already. What’s that like? DiBenedetto: The path I’ve gone about to get here makes me appreciate it a million times more. It is cool. My path to get here is super old school. I’m a first generation racer, I don’t come from funding, nothing. I’ve had to work my way up the old school way. But it makes you better, makes you work hard, makes you appreciate it more. I’ve had people tell me in the past I’m too much of a gamble and this and that. Some people have lit extra fires under me so I’m one determined individual with this group of people. So, it’s good. I’m glad I’ve gone about this way. 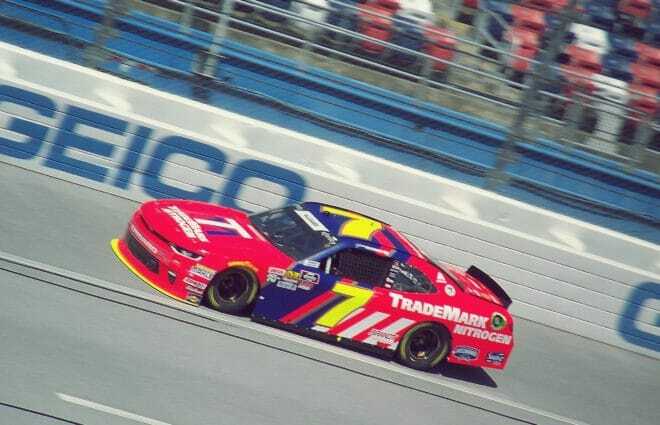 Massie: Do you think that the “buy-a-ride” culture is as prevalent in the Monster Energy NASCAR Cup Series as it is in the lower levels? DiBenedetto: Not completely. Sponsorship is important — these teams can’t operate without sponsorship, but you have to be talented at the Cup level though. You can’t just jump in a car and ride around in the back. Nobody enjoys that, so there’s got to be a happy medium. You’ve got to have sponsorship, but you’ve got to have a good driver at this level. And there’s a lot of change going on in the sport too, and I think it’s going to be good for that in the future in trying to cut costs and help these teams out. So I think everything is going in the right direction. Massie: Tell me about Bob Leavine. How would you describe him? 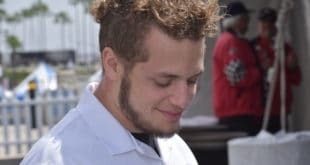 DiBenedetto: Bob and his wife Sharon are — and I’m not just saying this because I drive for them, I knew them well before I was driving for them — some of the nicest, most down to earth, most genuine individuals. And that’s how I got to know them because they were just such nice people that I got to know them at the racetrack and just became friends with them, honestly. And then I bugged them for a few years, kept telling them they need me to drive their race cars. I was persistent, bugged them enough, and he or Sharon never treated me like I was bothering them. I’d call them random times during the week, anything, trying to get the opportunity. And he always answered my calls, always as honest as can be. So I have a lot of respect for them. Massie: Okay, last question, and I’ll put you on the spot here. If you could describe the Leavine family in one word, what would it be? DiBenedetto: I would have to say honest because, like I said, every time I’d call them, they weren’t hiding anything. It was just straight open book. There’s a lot of amazing qualities about them, but that was the one that stuck out the most. You don’t find a ton of people like that in today’s world that just say it the way it is. 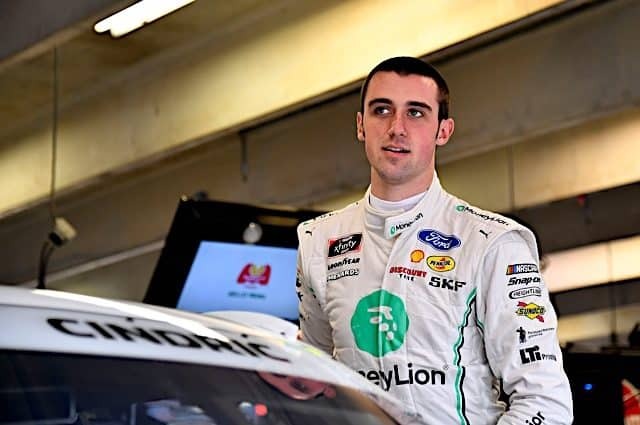 Next NASCAR Mailbox: Which Underdog Team Can Keep Up Their Strong Start All Year Long? Good to hear from a nice guy who does his best with the tools he’s given. Michael posed a lot of good questions, but I am still trying to determine if Matt’s answers were the result of optimism or to realism. More than one person has commented that Toyota will have to do something to keep their younger talent in Toyota cars next year; a subtext of those comments seems to include the only 2020 safe cup seats at Toyota are those of Busch, Hamlin, and Truex. I would guess at this point, a driver’s best interest is served by being publicly optimistic.